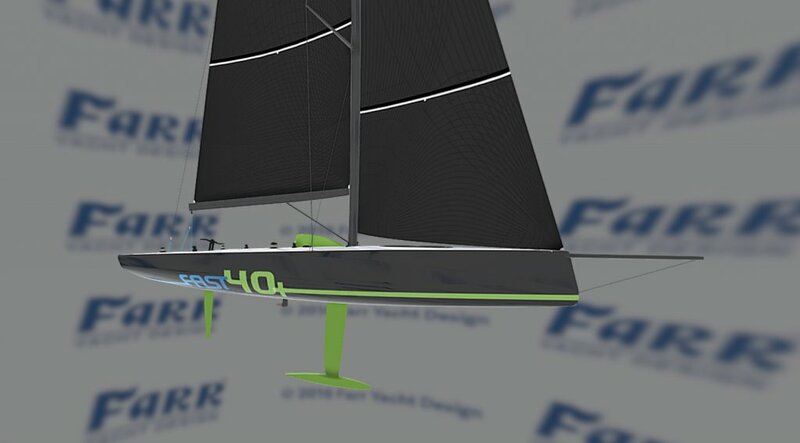 Around the world we are seeing a resurgence of interest in high performance race boats at the 40’ size. 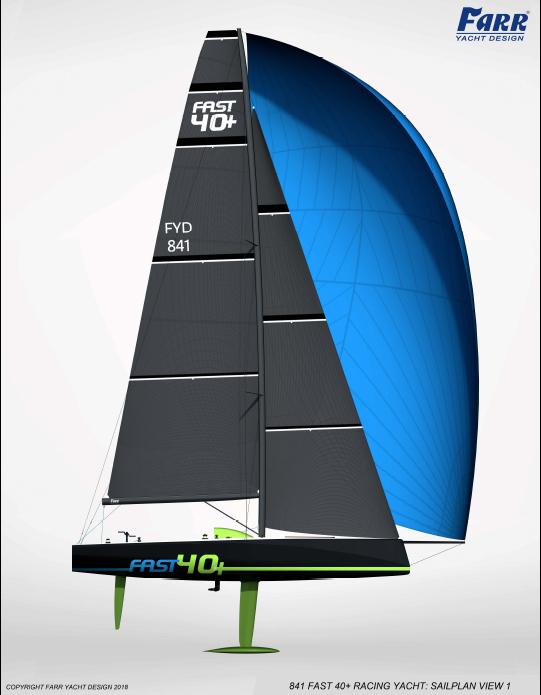 Originating in the UK, the Fast 40+ class has gone from strength to strength providing exceptionally close racing for well matched, high performance 40 footers. We are seeing an increased interest in boats of this style around the world, and particularly focusing on boats that are not limited solely to inshore style racing. 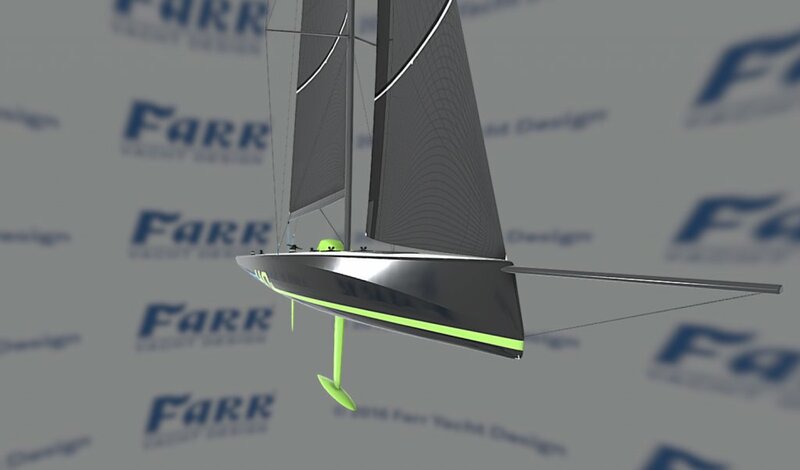 We have developed a new design that meets the Fast 40+ class limits but is specifically optimised to a larger component of offshore sailing conditions; positioned to excel in both inshore regattas and in the offshore races. Easily remode-able to optimise for inshore or offshore focused schedules. 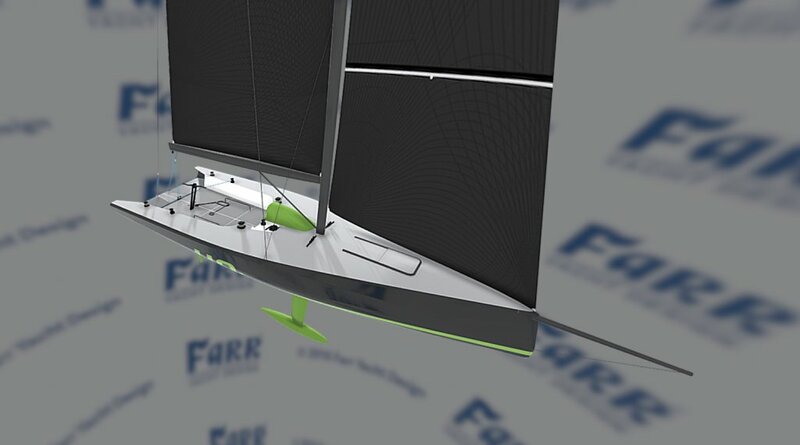 All hull, deck and internal structures are foam-cored carbon laminates, engineered to meet ISO 12215 Scantlings, as currently required by World Sailing’s OSR Structural Plan Review, and optimised to use a combination unidirectional and multiaxial carbon fibers, pre-impregnated in epoxy resin. The use of prepreg materials throughout the boat results in laminates with superior strength and toughness when compared to other advanced construction techniques such as infusion, and allows a higher degree of weight control. Because interior features are not required for class or rating purposes, the content of the boat below decks is strictly determined by the inshore/offshore moding necessary for the intended events. It is envisioned that the boat would be configured entirely empty for inshore events, and with a minimum of equipment as needed for individual offshore events. The structural layout of the boat has been optimised for sail movement, and specifically for the spinnaker takedown system. 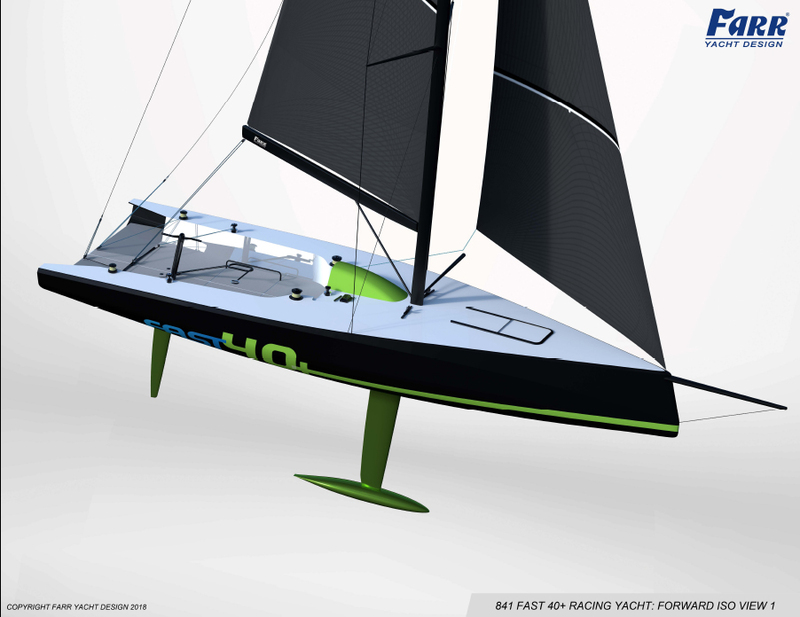 The hull topside shaping aft, freeboard height, and cockpit geometry have been optimised for upper and lower bunks sets for offshore racing providing the ability to maintain ideal trim and righting moment. All secondary components, electrical and mechanical systems are critically important to be weight optimised as much as budget permits. The deck geometry is designed to minimize weight, lower the vertical center of gravity, simplify tooling geometry, and ensure that all sail controls are located optimally for crew usage. The deck camber and sheer treatments are developed to reduce windage and shed green-water efficiently and are conceived for maximum aerodynamic benefit balanced against sensible building expenses.The asymmetric deck layout follows modern Grand Prix race boat practice, for high efficiency and fast maneuvers. The layout features athwartship jib tracks that offer excellent control over upwind headsail sheeting angles. When heavy air reaching under jib, a whisker pole fitted to the mast partners, allows sheeting of the headsail at angles wider than the local sheerline. The fixed [but removable] sprit allows for a straightforward tackline arrangement and simplified pit setup. The boat features an asymmetric companionway which permits the halyards to be led to a single pit winch on the starboard side of the offset companionway which reduces the winch count. The companionway can be protected with a removable hard dodger for offshore racing. The mainsheet controls (cunningham, outhaul, and traveler) are led to cockpit so that all of the main control lines are within reach of the main trimmer. A primary grinder pedestal system is located aft for weight placement and allows for high speed spinnaker gybes, sail hoists, and string line spinnaker drops. All lines are below deck where possible for a clean layout with maximum windage reduction. Enclosed below deck line passages contain water for a concerted effort at a dry offshore boat. The forward hatch features an air gasket control seal system to maintain watertightness. ** Southern Spars Rig Upgrade Available on request. Farr Yacht Sales offers the details of the listed vessel in good faith. We are diligent in presenting the above facts and inventories of the listed vessel but we cannot guarantee or warrant the accuracy of the information nor warrant the condition of the vessel. The buyer, whether himself or through his agent or his surveyor, should conduct such investigation, independent confirmation and additional due diligence as the buyer deems necessary before purchasing the vessel.This vessel is offered subject to prior sale, price change, or withdrawal without notice. The FAST 40+ class was established to bring together a collection of grand prix ~40 foot race boats with similar parameters under a maximum IRC rating of 1.270. Within the class, new boats can vary boat displacement, sail area, ballast weight and several other variables while remaining below the maximum rating. However, a maximum 12.6 m hull length, maximum displacement-length ratio and a minimum rating versus length ensure that the boats are similar in weight and sail area, etc. 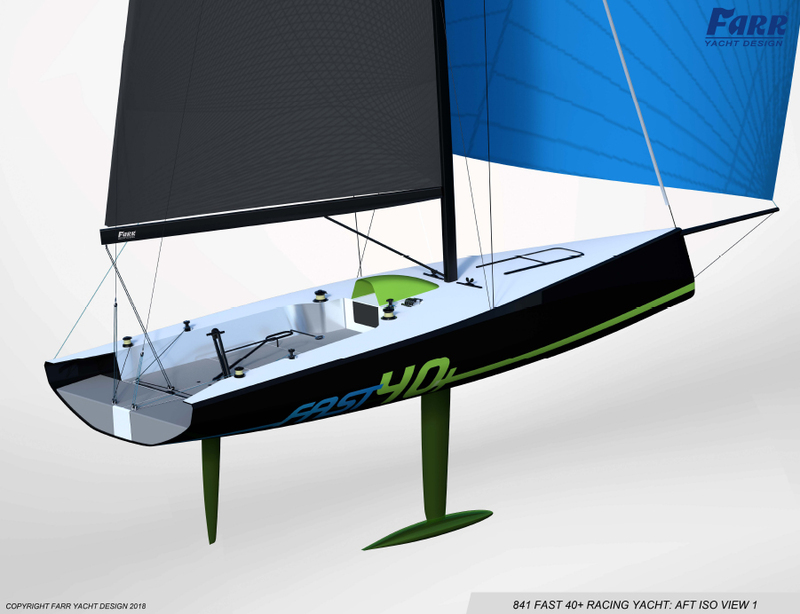 The minimum rating (based on length) of approximately 1.250 will not permit a boat to be rated substantially below the fastest rating, so the majority of racing among purpose-built FAST 40+ designs will be ‘boat for boat’, with little handicap effect. As a result, our target is always to achieve a rating of 1.270 while maximizing on-the-water performance. the primary design choice a trade-off of displacement against sail area. With all other variables unchanged, a lighter boat will be restricted to less sail area and vice versa. 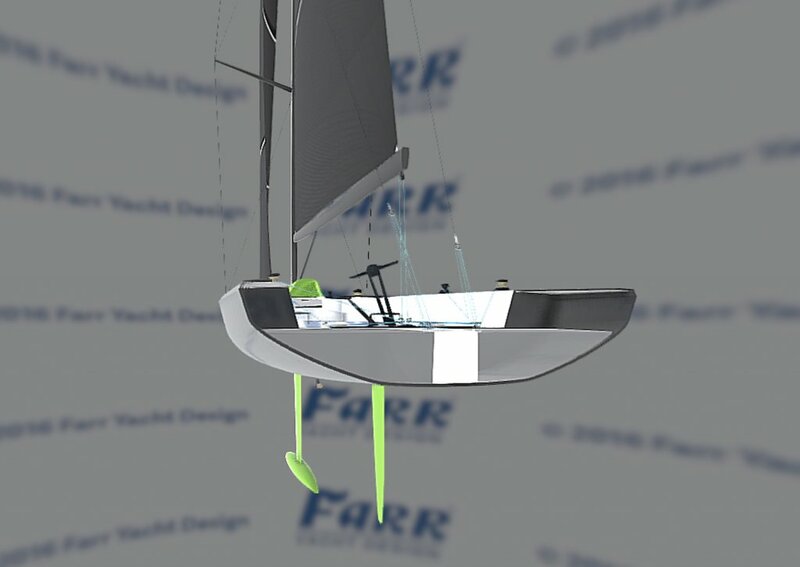 Other design choices, such as appendage construction type and rig features will affect the permitted sail area, but the underlying design choice of displacement versus sail area remains similar. When creating a FAST 40+ from a clean sheet of paper some dimensions are known, others have a secondary affect and some are critical. 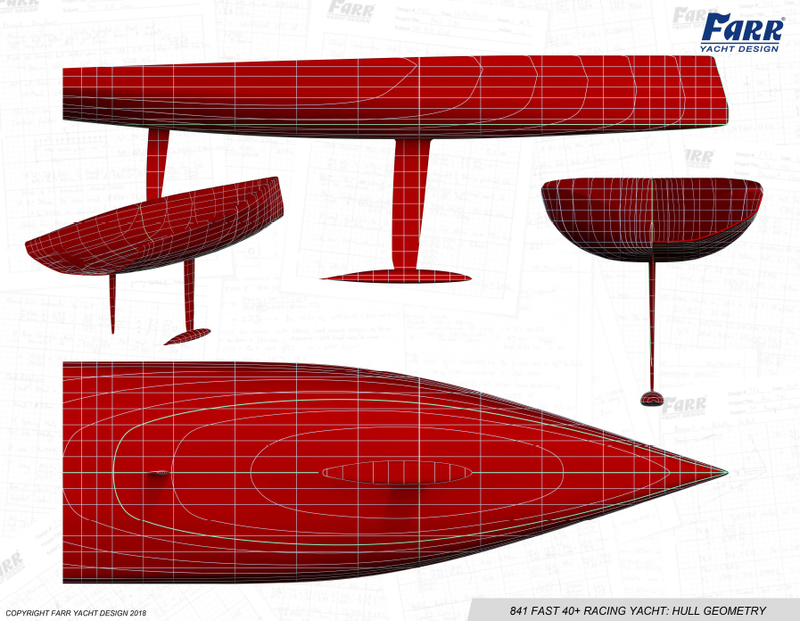 The boat length and keel draft are established at the class maximums. Interior fit out is not a significant rated parameter for this style of racing boat. Beam variations do not impact the rating significantly, making the chosen value a result of the hull optimisation.